Don’t listen to her! Look at her shoes! Permalink: Don’t listen to her! Look at her shoes! I’m so sorry lady, hand over the tripod and nobody gets hurt. Permalink: I’m so sorry lady, hand over the tripod and nobody gets hurt. Who doesn’t love a lady holding a three legged dog? Permalink: Who doesn’t love a lady holding a three legged dog? At least you were wearing underwear. Permalink: At least you were wearing underwear. Oh my God, is that Rachel Berry star of Broadway’s smash hit musical Funny Girl? Permalink: Oh my God, is that Rachel Berry star of Broadway’s smash hit musical Funny Girl? Am I still here? Am I invisible? Permalink: Am I still here? Am I invisible? Permalink: I blame Sarah McLachlan. Years of skinny jeans have prepared me for this performance. Permalink: Years of skinny jeans have prepared me for this performance. I always carry sheet music with me just in case. Permalink: I always carry sheet music with me just in case. Is Liza off her meds running around Central Park again? Permalink: Is Liza off her meds running around Central Park again? You always have to have your guitar 80% of the time. Permalink: You always have to have your guitar 80% of the time. 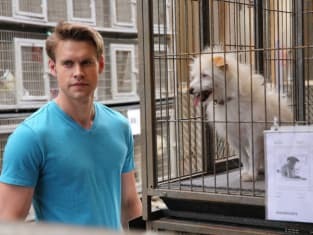 Glee Music: "Old Dog New Tricks"
Glee Review: Who Let The Dogs Out?